As mentioned last year, I stopped off doing Mortality Mondays when my husband Stu was diagnosed with metastatic prostate cancer… and while I still look at mortality stats all the time (and talk about them), I just didn’t feel like continuing that on this blog. However, I have been waiting for this year, as it’s the centenary of Spanish Flu pandemic. It’s a big deal. The pandemic, according to the wiki page, raged from January 1918 to December 1920, so I may get a few years’ worth out of it. And you may see what marks out a pandemic compared to regular seasonal flu epidemics: generally, you don’t get spikes of seasonal flu in the summer or fall. Generally they peak in January/February. Remember the 16th Amendment allowing for federal income taxes was adopted in 1913, and used to full strength during World War I. The U.S. entered WWI in April 1917, and was there to the end in November 1918. One unusual aspect of the 1918 flu was that it struck down many previously healthy, young people–a group normally resistant to this type of infectious illness–including a number of World War I (1914-18) servicemen. In fact, journalist Gina Kolata has reported that more U.S. soldiers died from the 1918 flu than were killed in battle during the war. Forty percent of the U.S. Navy was hit with the flu, while 36 percent of the Army became ill, notes Kolata in her book on the subject. So, while I will be looking for indications of the flu pandemic sweeping through New York communities in 1918, I assume many will be hidden… just like so many deaths from AIDS were masked in the 1980s, but can be detected via various clues. Most of the time, I will be drawing from the archives of The Brewster Standard, which is the paper in the NYS Historical Newspapers archive closest to where I live, but I may be pulling from other papers over time. 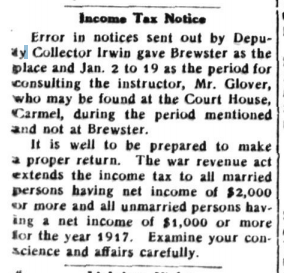 Here are a few items from the 4 January 1918 issue of the Brewster Standard (that income tax item also came). I wonder if we’ll keep getting the district nurse report over the weeks. By the way, one of the convenient items here is the Brewster Standard was a weekly paper, consisting of only 8 pages. So it makes it easy for me to find everything I want. Heck, I still use Vapo-rub. Have an open jar by my bed right now. You can buy some on etsy! Uh. I wouldn’t use it, tho. In or around 1870, Frank J. Cheney purchased the rights to Dr. Henry S. Hall’s “cure” – a drug that Dr. Hall had formulated and prescribed to his patients. I was unable to locate any specific information on Dr. Hall himself but Cheney appears to be one shrewd and powerful (as in “connected”) businessman. Cheney Medicine Company did a booming business for several years …. until the patent medicine industry began to be investigated and exposed by scientists and the American Medical Association. In 1871 Cheney began employing a very effective advertising campaign. His ads weren’t flashy but they were everywhere – by the late 19th century he was advertising in over sixteen thousand newspapers world-wide. This type of advertising was likely what kept newspapers of that day afloat. One hundred dollar reward for any case of catarrh that can’t be cured with Hall’s Catarrh Cure. In response to the scrutiny and action threatened by state legislatures, Frank Cheney was instrumental in the formation of The Proprietary Association of America, its primary purpose being to protect the interests of the patent or proprietary medicine industry against state legislation and regulation. Frank Cheney shared his advertising secrets and ploys with fellow members of the Association and for awhile those conversations and strategy sessions were kept from the public. An investigative journalist, Samuel Hopkins Adams, wrote a series of articles for Collier’s Weekly in 1905 exposing many of the false claims of these so-called miracle cures. Adams also exposed the Association’s secrets. As a result the general public was made aware of the fraud being perpetrated upon them, and the federal government began to take action. The Pure Food and Drugs Act was enacted in 1906 and eventually the Food and Drug Act would be passed years later. Frank Cheney died in 1919 and his 1886 affidavit ad (see above) was still running in newspapers. Well, it certainly was in 1918. Evidently, it was supercold in New York at the beginning of 1918. Brrrrr. Much colder than our recent cold snap. But I do have a blocked pipe because of the cold (not where it can burst, thank goodness)… hoping the thaw tomorrow will take care of that. I’ve been dumping boiling water down the drain, but no go. There’s a lot of war news in the paper, so these aren’t all the war-related items. I just thought they were interesting. I assume the heavy bombers of WWII fit this description, but I wonder what exactly they had in mind. FWIW, there were a few obits in the paper, but they were of two older ladies (in their 70s, approximately) who had already been widowed. One of a stroke, and the other who died in her sleep, presumably of heart failure of some kind. There are notes of people suffering from colds, pneumonia, flu, and other seasonal ailments.